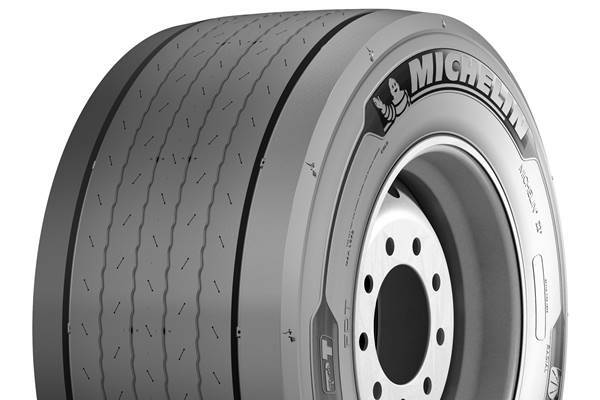 Michelin has expanded its X Line Energy tyre range with the launch of six new fitments, which, according to the company ‘enables more truck fleets to benefit from its most fuel-efficient truck tyre generation’. Designed primarily for mega-volume trailers, car transporters and low height tractor units, the new additions are said to offer improved mileage, increased fuel efficiency and a lower rolling resistance compared to the previous generation of Michelin fuel-saving tyres in these sizes. The launch sees Michelin X Line Energy multi-position tyres now available in 315/60 R 22.5, 295/60 R 22.5, and an all-new 355/50 R 22.5 size. Drive variants are offered in 315/60 R 22.5 and 295/60 R 22.5, while the trailer range has been expanded with 445/45 R 19.5 fitments. All new sizes are said to offer improved mileage potential over their predecessors, with the 315/60 R 22.5 and 295/60 R 22.5 all-position tyres projected by Michelin to offer 30 per cent and 17 per cent improved mileage potential, respectively. Michelin says the new fitments will offer a fuel saving of 1.25 litres per 100km during the tyres’ first life – and up to 2.5 litres of fuel saved per 100km when the tyres are new. The new tyres’ efficiency is highlighted by their fuel efficiency rating under EU tyre labelling legislation. The new 315/60 R 22.5 all-position and 295/60 R 22.5 all-position tyres improve from a ‘C’ to a ‘B’ rating versus their predecessor, whilst the 315/60 R 22.5 drive and 295/60 R 22.5 drive tyres have improved from ‘D’ to ‘B’. The 445/45 R 19.5 trailer tyre has jumped from ‘C’ to ‘A’, whilst the all-new 355/50 R 22.5 all-position tyre has a ‘B’ rating. The new tyres are available on both the original equipment and replacement markets.